Since starting this blog back in 2013 I have slowly learnt that when a new product or range is released I don't always need to run out, jump on the band wagon and buy it/them - mainly because my bank account doesn't like it - but there are some things that I can't help but go "oooooo" and pop into my basket as soon as I've spotted them and this happened to be one of them. 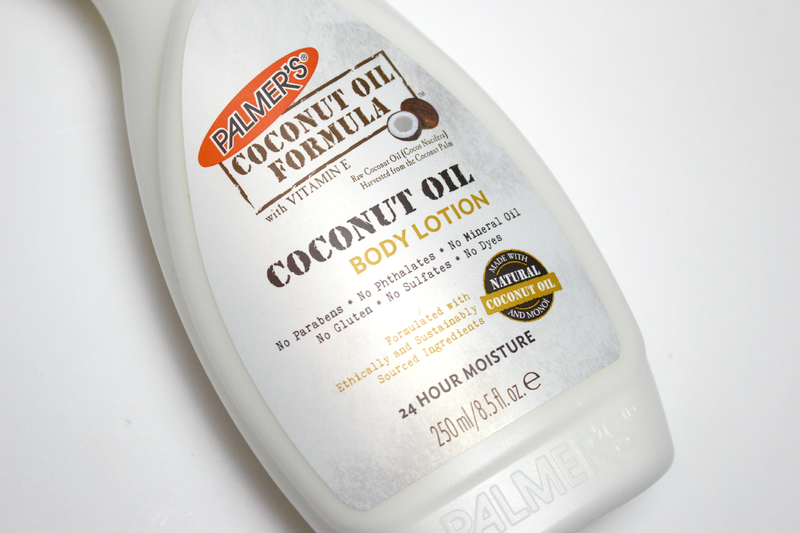 Palmers are well-known worldwide for their aray of amazing cocoa butter based products - whether it's a hand cream or a body lotion I'm sure most of you would have used something from the brand before. I spotted this new Coconut oil body lotion last week and before I'd even looked at the price I knew I was going to buy it. I LOVE the scent of coconut and coconut oil is one of those beauty products I just adore so seeing this new lotion I just thought win-win! This stuff is alot thicker than I imagined for a 'lotion', creamy and fluffy it has a real luxurious feel to it and a little bit goes a long, long way! I've been using a 20p-50p sized dollop to do each leg every evening aswell as popping some on my arms and stomach. The ingredients in the lotion are raw, natural ingredients and are Paraben, Phthalate, Mineral Oil, Gluten, Sulfate & Dye free - which I know will make alot of you readers happy! The coconut oil deeply moisturises and softens while the Monoï Oil helps to keep the skin hydrated - perfect for this hot and humid weather - leaving the other main ingredient, almond oil, to soothe and comfort. (hello help for sunburn!) Plus it has Vitamin E ... which we all know I'm a huge fan of! After only a few days of using this stuff I am ecstatic with the results! I have only been using this at night as the scent is quite strong and although I love it it's a bit much to wear each day alongside perfumes but it honestly keeps my skin feeling hydrated for the 24 hours it promises! Priced at £4 and seeing how little I need each time to cover myself H2T - this is hands down going to become a staple in my beauty routine, such a bargain, high five Palmers! This sounds AMAZING! I'm definitely going to have to go out and buy this. Haha, As soon as I saw this pop on my reading list I thought, Ohhh I need to buy this. I'm not a huge fan of strong scents but my legs need some good attention so I'd be tempted. I love the original Cocoa Butter as well as the Body Oil so this sounds like a winner! I LOVE Palmers, everything they sell I'm addicted to. No doubt this will be the same! Wow, that's what I was searching for, what a stuff! I really like the way you describe. A good body lotion is an essential part of a good skincare regime. So i regularly use sakare's body lotions. تابع معنا عروض وخدمات مميزة من افضل شركة تنظيف شقق بالمدينة المنورة باقل الاسعار واعلى خدمة مقدمة من المتميز ..
افضل اشكال مصاعدباقل الاسعار واعلى خدمة وتصاميم مختلفة من شركتنا المميزة ..
استمتع الان بالعروض والخدمات المتميزه من خلال شركة العالمية والمتميزفي مصر شاليهات العين السخنة علي اعلي جودة في العمل استمتع الان بالكثير من عروض الرحلات المتميزه في مصر . افضل التقنيات المتطورة والحديثة علي اعلي مستوي استمتع الان مع صيانة ويرلبول علي مستوي عالي جدا في العمل استمتع الان باقوي العروض والخدمات . يمكنك الان الحصول علي افضل الخدمات من خلال شركة عزل خزانات وهي شركة اللويمي افضل شركة عزل اسطح بالمملكة العربية. تفضلوا بالتواصل مع شركة ابادة الحشرات بالجبيل للقضاء علي اقوي الحشرات الزاحفة والطائرة وغيرها من انواع القوارض والزواحف عن طريق افضل فريق من عمال الابادة في شركة مكافحة حشرات بالجبيل والتي تخدم مناطق الخبر والجبيل.